Whilst I was still in Kuching, I took the opportunity to explore the place even further. This trip, I headed over to the Gunung Gading National Park which was located in Lundu, around an hour plus journey from Kuching. Being overlooked most of the time, Gunung Gading is a great place to go for those who love the outdoors. I made my way here on a Saturday morning with my family. The national park can be a little bit hard to find as the signboards leading to it is kinda small and hidden away. After driving uphill for about 10 minutes we arrived at the entrance of the park. We started our journey, after handing over our numbers to the park ranger. 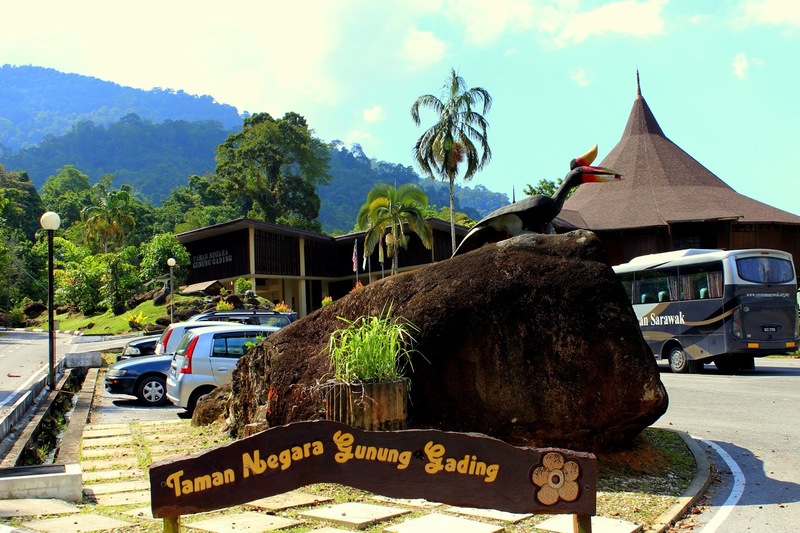 The Gunung Gading National Park is opened daily from 8am to 5pm. Entrance fees are RM10 for locals and RM20 for foreigners. The park is not only known for the world's largest flower, Rafflesia, but also for its scenic waterfalls and wildlife. 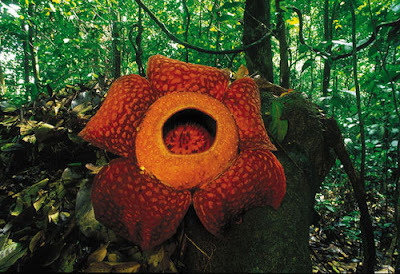 Spotting a Rafflesia flower is hard, as these flowers require nearly perfect conditions to bloom. Much to the disappointment of tourists, these Rafflesia flowers bloom at any time of the year and when it does bloom, it lasts for only 3 to 5 days before rotting. Found only in Borneo, Java, Sumatra and the Philippines, the Rafflesia is actually a rare parasite that can only be hosted by one type of vine, Tetrastigma vine. The Rafflesia smells like a rotting meat and can be smelt from quite a distance. Alternatively, you can also check with the Forestry Office in Kuching to find out whether any of the flowers are blooming. That was something we forgotten to do before coming here. We weren't that lucky that day as there wasn't any Rafflesia blooming. There are a variety of trails available for visitors to Gunung Gading to explore, ranging from a short stroll to more challenging overnight hikes over the summit of Gunung Gading to the old Communist base camp at Batu Bekubu or to the summit of nearby Gunung Perigi. As you can see from the pictures, the longest trail here is the Batu Berkubu trail which takes 6 hours one way. Thats a 12 hour journey to and fro. And since we weren't equipped or prepared for it, we opted to for the waterfall no 7 instead as it is well known for the waterfall with the best view. On our way up to the waterfall, we came across the "Apek's Cave" (Old Man's Cave). The story is that an old Chinese man called Apek got lost on this mountain and he used this cave as a shelter for a few days while attempting to find his way back. Every night he slept under the outcrop of the rock and prayed to it to show him the way. When he finally did find his way back, he attributed this to the rock and afterwards came back everyday to pray and offer incense to it. Till today there's a pot for burning incense underneath the rock. Other trails include the e former British base up, and over Gunung Gading, along to Batu Berkubu, the site of the former Communist Guerilla base camp and the View Points Trail, which provides some vantage points for views out to Lundu and southwards along the coast. After half an hour following the trail, you will come up to the third waterfall which has its own story. Legend says that there were three princesses living here long time ago. They planted the "bamboo of love" which is guarded by the animals, and according to the legend, if you can find this bamboo you will be loved by all and you will be able to have 10 wives. We didn't spot any bamboo there, though. Haha ! Maybe thats for the best. The waterfall here has a really nice view, and it can be kinda quiet as not many people come by here. The waterfall looks really tempting to bathe in, however swimming is prohibited here. As we made our way to the top, the trail got even steeper. Nevertheless we still pushed on, and as soon as we heard the gushing noise of the waterfalls, we all filled with enthusiasm. Tired from all the climbing, we finally took a dip in the 7th waterfall. The water was really cool and refreshing. There wasn't many people around there, so it was pretty quiet and relaxing. According to legend, Gunung Gading got its name from one of the 3 princesses who loved to bathe in the 7th waterfall. They were Puteri (Princess) Gading, Puteri Sri Guar, and Puteri Sri Geneng, each of whom was a guardian for the 3 main peaks. And according to the stories, if you are very lucky, you might see a fairy or mermaid bathing here early in the morning. After about half an hour there, we packed up and made our way down. The journey was pretty smooth, just that my shoes were the one that kept bugging me. Half way down, the soles of my shoes gave way! I had to practically walk bare foot all the way down. We dropped by the Rafflesia Boardwalk on the way down. This well-made boardwalk follows and criss- crosses a pretty little creek up through some attractive vine-draped rainforest. About 60 trees along this boardwalk are labelled with scientific and local names, providing a good opportunity to learn about the trees of the rainforest, and to see how rich and diverse the rainforest is. The journey down was of course less taxing and it took a shorter time. We all did occasionally slipped as the trail was slippery. To sum it up, it was a great and memorable trip. We all were dead tired after that day. We dropped by Lundu for some lunch before heading back home. In a nutshell, Gunung Gading is a great place for those who want to get away from the hustle and bustle of the city. I wouldn't mind coming back here again one day. yeap, this place is rich with history :) You're welcome ! Hm..it was an exciting get away weekend huh! !you got to experience the jungle walk and the beauty of the mother nature...great waterfall!! yeap it was. You should check it out too ! Why is swimming prohibited in waterfall no 3? Any idea ? Hi Haillie, sorry for the late reply. Well, there was an incident a while ago, where a few kids got drowned while swimming in waterfall no3. It must be because of the strong current there, that is why swimming is prohibited now. Hi. How long is the trek up to Waterfall 7, and is it steep? I'd like to try it but being a super novice at physical activities, I'm afraid it might be too strenuous for me. Hi Widya, trek to waterfall 7 should be approximately an hour depending on your speed. It shouldn't be too strenuous depending on your stamina. Good luck in your hike. WINENLOSE88.COM hadir untuk para bettor mania sebagai AGEN BOLA,AGEN JUDI,BANDAR JUDI.